It's something you may have already come across before and if you haven't, a family member or neighbour probably has. They're Energy resellers who often canvass neighbourhoods in search of unsuspecting home owners or renters with promises -- or outright lies -- of better deals on the cost of energy, be it Hydro or Gas. After being scripted into signing up, many find out too late that they've been deceived into signing a contract completely unlike anything the deceptive door-to-door salespeople promise. 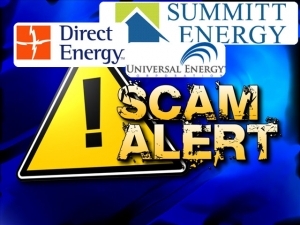 Summitt Energy is the name of a company we have recently received startling documents regarding. What we've reviewed were forged signatures and recordings of deceptive sales calls. Deceptive tactics often start at the front door, where salespeople sometimes looking much like municipal hydro workers show up, even producing ID cards resembling something official. The followup telephone calls may be described as nothing less than confusing and manipulative. Summitt and others such as Direct Energy hire so-called independent sales agents to use tried and tested sales tactics, usually rather deceptive, to get your municipal energy account number and trick you into signing a contract. According to a telephone recording we've acquired, telephone sales agents of Summitt Energy used confusing language in telephone conversations to get you to say one thing: "Yes". "Yes" to lower energy rates and "Yes" to a long-term contract with a company you know nothing about. The problem and deception here is the energy rates for hydro are never lower than the sales agents claim local utilities charge and after signing up, you may end up with a bill at the end of the month 5 times higher than one would expect. One Toronto resident who knew nothing about being switched over to Summitt Energy was appaled to receive a bill with charges of over $900 for two months of service in a 1200 square foot duplex apartment. This scam involved a forged signature on a never-before-seen contract shortly after displaying a Toronto Hydro bill to a Summitt Energy salesperson, posing as an official from Toronto Hydro at his front doorstep. Some victims claim they've been offered a protection plan on their energy prices and though it seems nothing like switching energy providers, it's just that. With electricity, consumers are always locked in to pay more for 5 years. With gas, it's a gamble that the resellers usually win. The CBC and other media outlets have ripped these companies and their practices wide open, yet they still continue to go door-to-door preying on ill-advised or elderly consumers. Summitt Energy was recently found liable by the Ontario Energy Board of using deceptive practices and ordered to cancel 17 contracts without charge or penalty. They are also now required to use plain language in contracts. In reply to the ruling, Summitt's president and CEO Gerry Haggarty stated "Summitt remains highly committed to taking all necessary steps to ensure our customers receive full disclosure relating to our products and customers understand both the value of our products and the terms of the agreement to best determine if our products are suitable for their needs," though their unethical and deceptive business practices continue until now. Energy Boards across the country do regulate the marketing and practices of energy resellers like Summitt and forgery and deception are both illegal and contrary to these regulations. Customers have every right to invalidate their contract if the salesperson was in any way deceptive and certainly where no contract was actually signed. Update: 3 days after posting this article, Summitt actually came on posting under the moniker of "Energy123" with some more tall tales on the status of energy prices. Refer to the 8th and 10th comments on this page.